A quarter of the UK's hugely expensive Apache attack helicopter fleet was mothballed when Afghan combat operations come to a close, the Ministry of Defence (MoD) has admitted. Sixteen of Britain’s remaining 66 Augusta Westland AH-64 Apache Longbow aircraft will be put into storage and used for spare parts now that the UK has abandoned combat operations in war-torn central Asia. The Apache was first used in operations in Afghanistan in 2006. It also saw combat in Libya in 2011, where it was flown from the decks of Royal Navy ships during the NATO-led operation which culminated in the overthrow of Colonel Muammar Gaddafi. The decision comes as generals and politicians question the government’s defense cuts. 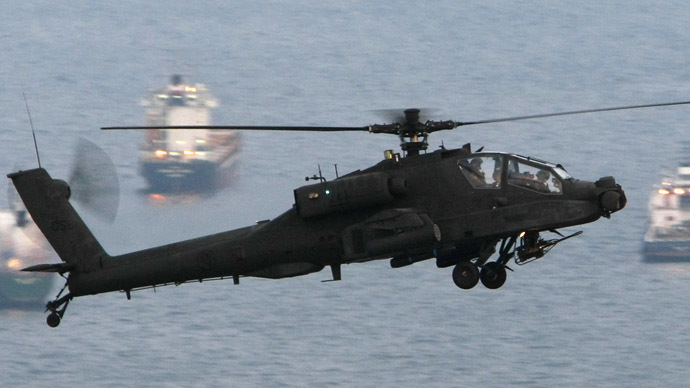 From the beginning of its operational service, Apache proved as critical to UK operations as it was lavishly expensive. In Afghanistan the helicopter became a mainstay of the fraught campaign, repeatedly having to come to the aid of ground troops pinned down in forward operating bases. The intensity of warfare created extra costs, with parts having to be replaced at a much higher rate than expected due to wear and tear. Acquiring the helicopter is estimated to have cost the British taxpayer over £4 billion pounds and the process of obtaining it and adapting it for British use was marred by technical problems. The Apache’s entry into service was delayed by concerns that it could not fly in icy weather and that faults in its radio communication systems would prevent it talking to other units and vehicles. It also had to be adjusted to prevent it from, in effect, shooting itself down. In an unmodified state, the Hellfire missiles it carried would have damaged the tail rotor when fired, bringing the aircraft crashing to earth. There was also a delay with regards to training pilots. Ready qualified pilots required a further two years of training in order to operate it. The aircraft’s best known pilot is Captain Harry Wales – better known as Prince Harry, fourth in line to the British throne – who served as an Apache crewman on his second tour of Afghanistan. He caused controversy by comparing his job as a co-pilot/gunner to playing a computer game. Sixty-seven were originally procured, but one was lost in an accident in Helmand province in 2008. While no UK Apaches were ever acknowledged to have been brought down by enemy action, they were regularly hit with small arms fire in both Afghanistan and Libya. In Helmand Province in 2014, one was forced to make a precautionary landing after it was hit by a bird.